When you’re suffering from a roofing emergency, there’s no time to wait for quality roof repairs. You need fast access to a trusted emergency roofing company that can perform the repairs you need most, no matter what. Trust Pioneer Roofers to be there for your emergency roofing situation. Our roofers are efficient, knowledgeable, and thorough. With more than 20 years performing emergency roof repair in Beaverton, we’ve become a go to company for local citizens and businesses during emergencies. 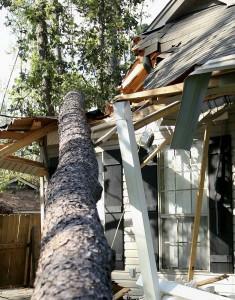 No matter when disaster strikes, or what the scope of your roofs damage is, we’re on call and there for you. Our emergency roofing services are designed to help you get quality repairs as soon as possible. The biggest danger, when facing a roof emergency, is water. Water damage is progressive, that means that the longer you wait for roof repair with a water related issue, greater amounts of damage can occur in increasingly shorter intervals. With regularly inclement weather in the Pacific Northwest, it’s easy to see why access to a trusted, local roofing company in Beaverton is vital for the safety of your roof. Attic and Ceiling Damage – Our Beaverton roofers provide fast relief from top floor damage. Water entering these spaces ruins plaster and paint, any electrical devices like lights and fans may also be affected, which can lead to fire hazards. Fire Damage – A little realized danger of water is risk of fire. It’s incredibly important to get repairs done as soon as possible. We can help eliminate the possibility of fire damage due to electrical sparks from water. Mold and Mildew – When you skip out on roof repair in the Beaverton area, you increase the risk of mold and mildew growth. It can take as little as 72 hours for mold growth to begin, and once it starts it tends to travel much further than the roof. Entering walls, floors, and ceilings, toxic mold growth from roof damage related incidents is common and can cause a variety of health problems. Insulation Damage – Leaky roofs can ruin cellulose and fiberglass insulation. It has a negative effect on insulating properties, destroying your home’s ability to lock in heat during the winter, and cool air during the summer. Structural Damage – The most detrimental and severe damage occurs structurally. Emergency roof repair can be performed on any roof style or material makeup to prevent further damages. Water causes wood rot, damages ceiling joists, rafters, trims, and framing. Make sure you get the situation handled before it gets out of hand and you have to replace your roof. We can repair everything from your pitched to your garden roof and so much more. No matter what kind of roof you have or when your emergency occurs, when you need emergency roof repair in Beaverton call (503) 281-0305 or contact Pioneer Roofers today. Beaverton is a top tier city for those looking to work in technology related industries. Citizens have access to a variety of companies to work for, and a thriving community of individuals with a passion for the city’s history and present. Those interested in exploring the area’s past, should be sure to visit the Historical Society & History Center. The center puts on interesting presentations every month where visitors can learn about history on a variety of diverse topics ranging from Johnny Cash to antique cars. Those looking for a fresh experience should enjoy the Farmers Market. Local citizens and farmers sell produce, food, and locally made and sourced goods.